The Face is Open with the additional snowfall we have received in February,and June Mountain has announced starting Feb.23 through Apr.3: Ski or Ride at June Mountain for only $37 a day *, Mon-Fri. We know everybody needs a little help right now so that's why we are extending our discounted Lift and Lodging tickets to everyone. If you haven't been here you missed some great powder days, and there is now enough snow to keep the park crew busy building full-size features. Some of this season's storms have been warm and wet, with rain levels almost up to the Chalet. This rain layering led to dangerous avalanche conditions on the Face just as there came to be enough snow for coverage, during the President's Day/Winter Break week. As of late February the weather continued variable, almost springlike, but more storms have come since then, into early March. .
*Ski or Ride at June Mountain for only $37 a day, Mon-Fri.
A minimum of three days or more must be purchased and can be combined with any weekend day(s) and save 10% off regular weekend rates! Contact a participating June Lake lodging partner. 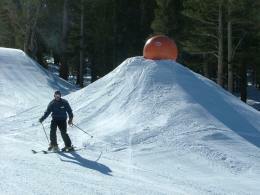 The promotion is not valid in conjunction with any other offer, and all lift tickets must be picked up at the June Mt. ticket office.